Signs of the Times asked Nancy Canwell to reflect on the meaning of the name Immanuel. We think you'll appreciate her thoughts. Did Judas Really Betray Jesus? The ���Gospel of Judas��� claims that Judas was Jesus��� closest friend, and that Jesus asked Judas to betray Him. Ed Dickerson asks, Is this true? Dan brown���s popular book, and now the film, make some startling claims about Jesus and the Bible. Robert K. McIver challenges their validity. Skeptics question the story of Jesus in the Bible. The author puts their arguments in perspective. How Real Is the Resurrection? Did Jesus really rise from the dead? Skeptics say No. However, Angel Hernandez examines evidence that the skeptics tend to overlook or ignore. Why did a man called Jesus die on a cross 2,000 years ago? The author explores the reason. Did Ancient Prophets Predict Jesus��� Birth? The Old Testament is filled with predictions of a coming Redeemer. Ed Dickerson explores some of the more significant ones. What Does Jesus Do All Day? Is Jesus patiently waiting for His second coming? Is He engaged in an endless building project? The author explains what Jesus is doing for you and me today. A preacher father heard a sermon about Jesus' death from his three-year-old daughter. Forgiveness was given on an outcrop just outside Jerusalem���s Damascus Gate. 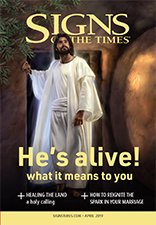 He is Risen: What It Means for You! Christian belief is a commitment that makes a difference in your life's outlook and in how you live it. Jesus loved to make people happy on the Sabbath, but some people accused Him of breaking the Sabbath. Which was it? Read Alejandro Bullon's response to that question. Ronald Graybill reflects on the kind of Person Jesus would have been 2,000 years ago���and his conclusions may surprise you. Why did God send His Son Jesus to die for us? Ed Dickerson explains that Jesus accepted God's rejection so that we would never have to. It was part of God's plan. Jesus lived nearly 2,000 years ago, so what difference does He make to us today? What If He Hadn���t Been Born? We typically think of the honor God bestowed on Mary in choosing her to be the mother of the Messiah. But Patty Ntihemuka reminds us of a more somber side of the story. Some claim to have found them. But is this true? So long as we have faith, do we really need to believe in the supernatural and incredible claims of Christ? And what Signs is doing to ensure that He didn't. There are many frauds claiming to be the Christ. Who really is Jesus? What If He Had Never Been Born? Randy Maxwell takes you on an imaginary tour of the world, letting you see what it would have been like if Jesus hadn���t come to earth two thousand years ago.